The mainstream media and government are communicating that the economy is on a positive track toward recovery while downplaying the likelihood of another economic catastrophe similar or worse than that experienced in the fourth quarter of 2008 and first quarter of 2009. In actuality, there is a significant chance that the U.S. will experience a severe economic collapse, beyond what has already been experienced, either this year or within the next few years. If there is a perceived, sustainable economic rebound before this happens, do not be fooled - the underlying economic problems still exist and will likely eventually surface in economic collapse. The U.S. has unprecedented, massive amounts of current and coming debt. Foreign countries have experienced their own crises, and they cannot offer added levels of debt funding for the U.S. Even if they could, they are unlikely to do so. Productivity is declining, and everything the government is doing is further hurting productivity. The U.S. is printing unprecedented, massive amounts of money and no longer has an ability to control inflation and deflation. 1. The U.S. has unprecedented, massive amounts of current and coming debt. U.S. federal debt is now over $11.4 trillion. As this graph is slightly outdated, you can imagine how far off the graph the line will need to go to chart the increase. The $3.6 trillion budget most recently passed is estimated to incur a $1.8 trillion deficit. The deficit is estimated to add up to $9.3 trillion over next decade. These are estimates by the government, but they include economic assumptions that have already been exceeded. For example, the budget assumes a max of 8.1% unemployment. We are now at 9.4% unemployment. This means the deficit will most likely be larger than projected. 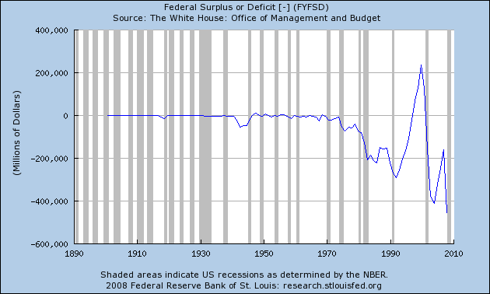 Even with the current estimates, the deficit line on the outdated graph below will go far off the chart. 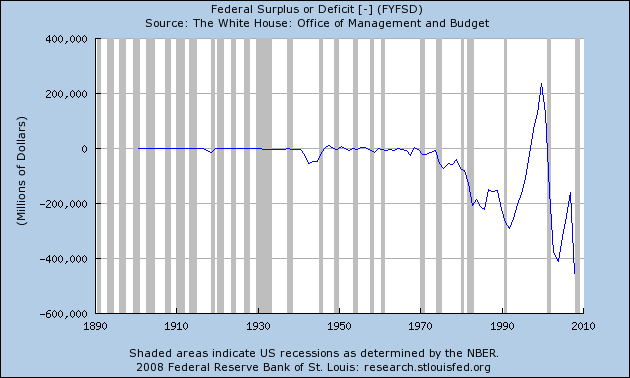 Also, the federal debt discussed above (bullet "A") will increase over time by the amount of the deficit. The U.S. has made long-term commitments to fund Social Security, Medicare, and Medicaid. Because of the increase in the retiring Baby Boomer population and the continuing increase in medical costs in the U.S., the demand on these payments is also increasing. Additionally, the U.S. government borrows from already-collected funds to undertake additional spending, adding to the entitlement funding problem. The coming added debt estimates from entitlements are as low as $43 trillion and as high as $102 trillion. To put these debt levels in context, total U.S. Gross Domestic Product (NYSEMKT:GDP) is about $14.1 trillion and falling. The graphed values are based on the $43 trillion low-end estimate as of 2008. There are several other estimates all the way up to $102 trillion. Since this graph was created, there are already significant increases required given the recently reported acceleration of the social security shortfall. Increasing interest rates beyond 2008 projected levels are likely to add to the debt beyond what is stated here. Likely slower GDP growth will increase the percentage of GDP stated here. Healthcare reform is an attempt to ease the blow of the coming Medicare debt tsunami. While it is possible that this will have some medium-term effect on the debt outlay (to the detriment of healthcare quality, of course), on the contrary it is also quite possible that it will quickly add cost/debt, and regardless, the timing for these changes to take effect will have little impact for several years. Below is a government-created graph of U.S. public debt (i.e. 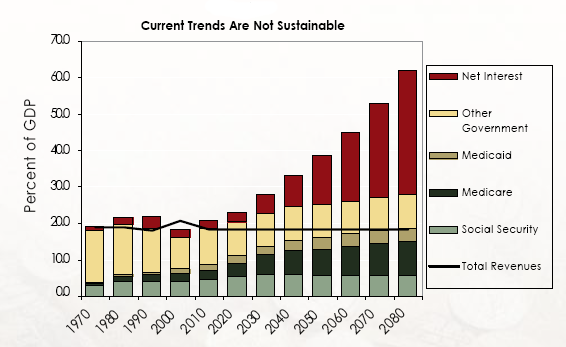 not including intragovernmental holdings, which bring the current debt total to $11.4 trillion) projections as a percent of GDP through the coming decades. We have already exceeded debt that is 50% of GDP and we are moving quickly past this level given our unexpectedly large current and projected budget deficits. The data line must be shifted significantly to the left given the recently reported acceleration of the social security shortfall. 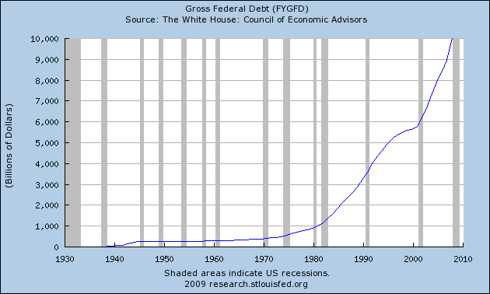 Likely slower GDP growth will increase the debt percentage of GDP stated here. 2. Foreign countries have experienced their own crises, and they cannot offer added levels of debt funding for the U.S. Even if they could, they are unlikely to do so. The issuance of U.S. Treasury securities is how the government gets loans to fund its spending activity beyond what it collects in taxes. If you buy a Treasury, you are giving the government a loan, which it has to pay back to you with interest. About half of public-owned government debt is held by foreign creditors. The 3 most significant U.S. debt holders are Europe (European Union and UK), Japan, and China. Japan and China make-up almost 50% of foreign held U.S. Treasurys at 21% and 24% respectively. It is unlikely that these lenders will continue funding U.S. debt to its requirements. Countries do not like our currency devaluation as it hurts the value of the return on their U.S. Treasury investments. Several EU countries and Russia are significant holders of U.S. debt. All of these countries have their hands full with economic problems in their own countries and with countries for which they are responsible within the EU. Take a look at the current landscape in Europe. In recent time as Eastern European countries have attempted to emerge as viable economies they have become significant borrowers from Western Europe. As Eastern Europe feels pain, the banks and economies of Western Europe feel pain as well. China is the largest creditor for the U.S. The country is currently growing at close to half the projected pace before the crisis. The lifeblood of their economy (exports) is declining rapidly, and unemployment is rising quickly. China is making loud signals about the declining value of their U.S. Treasury holdings, and backing up their words with consistent moves from long-term treasury holdings to short-term treasury holdings. They are also quite vocal about the need for the world to move away from the U.S. dollar to a new global currency. China is quickly diversifying their investments away from the U.S. so that they do not have so much dependence on exports to the U.S. and the declining value of their U.S. Treasury holdings. They are doing this by investing in other country's tangibles and through focusing more on growing their own domestic economy. Most recent statistics show China's holdings of U.S. Treasurys now likely at nearly half of China's GDP. Given the country's troubled economic situation in the crisis, signals of looking for a U.S. dollar alternative, and the diversification of their investments into other country's tangibles and their own domestic economy, China is not a reliable source for ongoing elevating levels of U.S. debt. 3. Productivity is declining, and everything the government is doing is further hurting productivity. Economic productivity is were value is created, which enables the government to collect the money it requires (i.e. in the form of taxes) to pay for its spending and debt. Additionally, productivity enables U.S. citizens to grow their savings and makes them more likely to invest the savings in U.S. Treasurys (i.e. debt). In our current situation, not only is productivity declining, but the government is overwhelmingly hurting the ability for productivity to grow at a pace that would allow our debt to be managed. -Tax structure hurts productivity - corp taxes, increases on cap gains, talk of national sales tax, etc. 4. The U.S. is printing unprecedented, massive amounts of money and no longer has an ability to control inflation and deflation. Products and services become more expensive before incomes can rise to afford them. Dilution of the value of the dollar. $1.2 trillion Fed balance sheet expansion - expected to expand to $4.5 trillion by September '09. Much of the purchases for this expansion are illiquid, long-term assets that are not easily sold when the money supply needs to be reined in as inflation escalates. Included is $300 billion dollars for Treasury bond purchases (i.e. quantitative easing) expected to expand to $1 trillion in purchases, especially since interest rates are quickly becoming uncontrollable. You may ask yourself why we haven't yet experienced inflation given all this money printing. What is actually happening is we are experiencing less deflation (contraction of the money supply, and appreciation of the dollar) than we otherwise would have without the money printing. Any kind of economic stabilization in the near future would cause the excess reserves (held-back credit) now in the banking system to quickly infiltrate throughout the economy and inflation would ensue. However, it's important to note that economic stabilization is not a requirement for inflation to surface and we could see inflation before any kind of recovery. Imagine if a guy named John took on a bunch of debt above the level of income and potential income that would allow the debt to be paid off. John then tries to float the debt by taking on new debt to pay off old loans hoping eventually he would make enough income to pay off all of the debt - except his income continues to decline. Eventually creditors would not be willing to lend to him and he would default and need to start over. This is the state of the U.S. government, except for one difference; the government's ability to print money to eventually pay off the debt at a diluted value. However, this makes the government's economic situation worse off than John, who would have defaulted. The below information more directly outlines the current U.S. situation. Because of the government's bailout philosophy and long-term policy plans, U.S. debt will continue to grow larger. Eventual rising interest rates will add to this debt load. 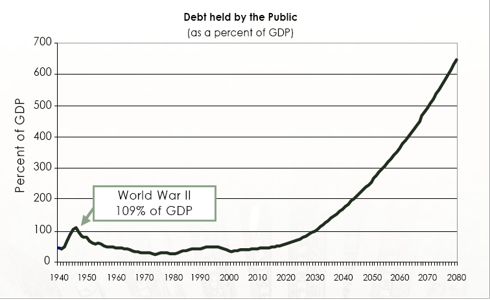 The debt has to be paid off - If it is not paid off, we will default and collapse. Productivity and taxes normally pay off debt, but we are becoming less productive and tax revenues are declining rapidly. Also, dramatic tax increases to cover debt are counterproductive to the economy. Even a good case turnaround in productivity is not likely to be enough to service the rapid debt growth. We are resorting to printing money to pay off the debt, but this devalues the dollar, which hurts our creditors when they are paid back with money of less value than they lent out. Major creditors, such as China and Russia, are swiftly switching their policies to have less dependence on the U.S. dollar. On top of these factors and despite what the mass media is communicating about "green shoots" and economic recovery, the U.S. economic situation is not getting better. There are several economic factors existing and forming that could cause an exacerbation of the current situation to trigger a full breakdown of our economic system. 1. The government's bank stress test results were not good, but still depicted U.S. banks as much healthier than they actually are. a. The criteria used for the worst case economic scenario was about as bad as the current economic situation, and will most likely be surpassed within the year. b. Recently changed accounting rules propped up the financial condition of the banks to favor better test results. c. The banks argued aggressively with the government to release better than actual results so that shareholders and customers would not lose faith. d. The tests were performed in a short period of time. Past bank stress tests have historically been quite inaccurate, and that is under testing processes performed over significantly longer time periods. e. The tests focused on 19 banks making up about 70% of the banking industry. The other 30%, which are smaller more localized banks, face different kinds of current and approaching problems. a. Residential Mortgages - estimated $1.1 trillion to $2.6 trillion in losses approaching from non-subprime Alt-A and Option ARM mortgages. Take a look at the below Credit Suisse graph to see the magnitude of resets approaching. f. Interest rate swaps (NYSE:IRS) - these derivatives add several trillion dollars of exposure in the event of volatile and/or rising interest rates. Note: The TALF and other government programs are supposed to help stifle the blows from the coming residential and commercial real estate losses. However, so far the TALF has been extremely ineffective. Less than $20 billion out of $1 trillion has been activated because the associated underlying assets are not deemed as good investments. Additionally, most of the key approach through these programs is to support the asset-backed securities and to refinance risky loans. The ability to refinance is highly problematic with dramatically declining residential and commercial real estate values, let alone rising interest rates. The diagram below depicts how the underlying problems are likely to play out within the banking sector, a current linchpin to the U.S. economy. Given the banks current conditions and coming wave of losses (residential real estate, commercial real estate, LBOs, etc) described above the diagram, the banks will likely need to be nationalized as the government will not allow them to collapse. This will be done by converting bank debt to equity and diluting non-government shareholders. This does not remove the underlying asset and capitalization problems. Instead, the government will print money and take on more debt to cover the losses. 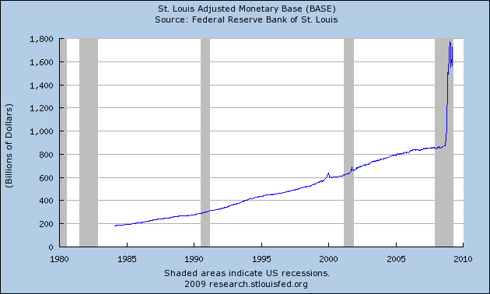 The money printing and increased debt supply will cause a natural rise in interest rates (i.e. to drive demand to buy U.S. debt) and decline of the dollar. If higher interest rates stifle the ensuing inflation, they will also further hurt the economy (e.g. causes more defaults, harder for lending, etc). If inflation continues despite higher interest rates, hyper-inflation is likely to ensue causing an economic collapse. California (13% of U.S. GDP), New York, Massachusetts, New Jersey, and other states are having multi-billion dollar budget deficit problems because of rapidly declining tax revenue and over-spending. If this doesn't lead to further bailouts (and therefore more money printing and/or debt), their infrastructures and economies will further breakdown before a leaner spending structure can emerge. The Pension Benefit Guaranty Corporation has a $33.5 billion dollar deficit (tripled in the last six months). They also estimate that the auto sector has $77 billion in underfunded liabilities, with $42 billion not funded at all. Pension breakdown is likely to continue to rise with state pension stress rising and as the auto sector triggers additional pension cancellation in other sectors. Obviously rising unemployment, expiring unemployment benefits, prematurely rising interest rates, rising oil prices, and a weakening stock market will only exacerbate and add to the banking and broader economic problems outlined. 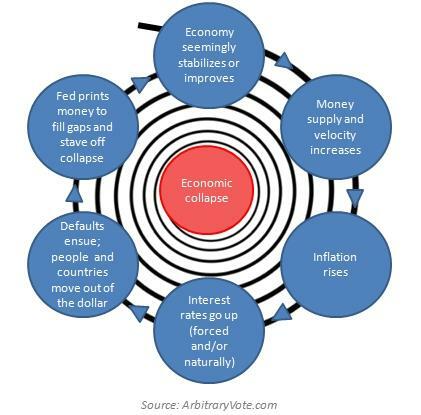 The banking and economic conditions, combined with the U.S. debt situation and money-printing practices, can lead to economic breakdown or more money printing to stave off the economic breakdown. The latter is the more likely case given the government's economic philosophy and direction during the crisis. However, this strategy only delays the inevitable as the underlying problems still exist. The resulting catch-22 of inflation and rising interest rates are what can cause catastrophe. Loans (personal and business) based on adjustable rates are more likely to default or become more difficult to service. People and businesses are less likely to borrow or be able to borrow, which can actually be a good thing, but slows the economy in the short-term. The interest on budget deficits and the national debt increases, adding significantly to the country's debt load. Interest rate swaps (i.e. hundreds of trillions of dollars in derivatives) run risk of default. The U.S. interest rate and inflation conundrum is unavoidable as debt is too large, productivity is too low, and money printing is our way of remedying the situation. The U.S. is vulnerable to an economic collapse through spiking interest rates, extremely high inflation (i.e. hyperinflation), or both spiking interest rates and extremely high inflation. The below diagram depicts the dangerous spiral. Because of America's great history and foundations of patriotism, many have said that we've been through this before, the country is resilient, we've always figured it out, and we will again. Positive thinking can certainly work wonders, but it is also important to not let it cloud the logic behind the critical nature of the current U.S. situation. The U.S. has been a great country, but history shows that even great countries can fail. As the first several graphs on this page depict, the U.S. is in a situation of unprecedented debt, deficits, and money printing. Additionally, the recent economic crisis has triggered problems in several sectors, and there are new, large problems on the horizon. All of this while policy direction shows little sign of an ability to fuel significant economic growth that might solve U.S. debt problems and cushion the coming economic blows. Japan had high savings rates and high demand for their exports (core to their economy) from healthy countries elsewhere. Although Japan did not experience a severe collapse, 20 years later their stock market is still around 80% lower than its peak before their crisis and they are experiencing continued economic stagnation. The conditions described to this point are enough to cause a severe economic catastrophe. However, the recent crisis combined with the current monetary policy direction, add extra elements to the equation that make catastrophe more likely. Even if they could sell off significant enough levels of balance sheet assets and increase interest rates to rein in money, an economic breakdown would follow because of the newly removed support of the latest grown asset bubbles within the economy. Hyperinflation is the dramatic devaluing of the currency in the case of a mishandled money supply increases by the central bank. This has happened many times in many countries in recent and distant history, and is most likely when a country has a fiat money system (currency backed by no assets), a lack of confidence in the government, and significant national debt that the country cannot manage to service. To understand the conditions that lead to hyperinflation and the results that stem from it take a look at the hyperinflation periods experienced by Zimbabwe, Argentina, Brazil, Germany, and others. Once hyperinflation begins, government tools used to fight it may stop the process, but deep economic pain is not avoided. As outlined at the beginning of this section, the Fed has put itself in a unique situation in which these tools are unlikely to be effective. The government's bailout and money printing policies distort pricing, hinder economic calculation, perpetually increase interest rates, cause fascist corruption, and leave no ability for genuine economic productivity to increase as entrepreneurs and businesses are discouraged from participating in the economy. Ultimately this is likely to create an environment that makes one of the above collapse scenarios more likely, but stagnation and slow decline can last for many years if not decades. In the unlikely event that the Federal Reserve succeeds at credit expansion to turn the economy back to significant growth, the new growth will be based on the same artificial fundamentals as our recent two bubbles - the dot com bubble and the housing bubble. A new bubble would be larger and more far reaching than ever and would burst harder than ever, sure to break what should have been allowed to break during the last two bursts, but with added problems from the most recent government remedies. The worst case scenario, and hopefully the least likely, is war. Throughout history times of economic stress have spurred on wars for various reasons (protectionism, government breakdown and disorder, desperation, the belief that it is an economic net positive, etc). All of the above scenarios are doom and gloom scenarios. Unfortunately that is the reality of the situation. However, there is a reason for hope no matter how unlikely this scenario may be to transpire. A revolutionary breakthrough, similar in economic magnitude to the industrial revolution or the information revolution, could ignite powerful, genuine growth that would allow the U.S. to grow its way out of its dire circumstances. We have no way of knowing if this will take place, but a couple possibilities might be an artificial intelligence revolution or a breakthrough in a ubiquitous energy source, such as cold fusion. An strong increase of treasury yields/interest rates - 10-year bonds are used to set mortgage rates. The Fed has tried to suppress these rates through expanding the Fed balance sheet and quantitative easing. Rates dropped shortly after announcing their plans, but have risen against their will since. A strong move above 4 or 5% on the 10-year yield could signal the abandonment of faith in U.S. Treasurys, or the ability for the U.S. to pay back the loans with money of held value. A spike in this rate can trigger a run on treasuries and a stifling of the economy. Additionally, the 1-month T-bill spiking above the current 0-.25% level could have a harmful effect. A failed treasury auction - Throughout the year, the Fed holds auctions to sell Treasurys so that it may borrow money to fund the budget deficit. There can come a time when the supply of those Treasurys is so high and demand for them so low that not all treasuries offered are sold. This is a failed auction. We have already had a few auctions this year that did not fail, but interest rates on the treasuries had to be raised to entice people to participate, which sends signals that U.S. debt is not very attractive. If an auction were to fail, the consequences could be a run on the U.S. dollar. A U.S. debt rating downgrade - The credit ratings agencies (Moody's, S&P, Fitch) rate U.S. treasurys just as they would any loan. The U.S. has long held a AAA rating on its debt. A downgrade of the U.S. credit rating would send a loss of confidence to its creditors and potential creditors which could cause rates to rise and an abandonment of the dollar. A strong drop in the U.S. dollar index - A declining value of the U.S. dollar is a sign that inflation (the increase in the supply of money) is increasing and confidence is being lost in the currency. A strong dip in value could cause an abandonment of the dollar. A bank holiday - Although unlikely given the potential for bank nationalization, a bank holiday could be ordered if the government believes the public has lost confidence in the banks and fears a run on the bank deposits. Bank business would be halted for a day or so to allow the government to absorb or prepare for potential losses. Bank nationalization - Given the high probability of U.S. banks experiencing losses beyond existing losses and those projected through the stress tests, the government has put in place triggers to convert bank debt to equity. This is the technical way of saying that the government is taking increased ownership in the banks under the premise that it will instill confidence and health in the banking system. This process will be accompanied with the announcement that the ownership will only be temporary, but the magnitude of the situation makes this highly unlikely. As Diagram 1 above depicts, nationalization does not solve the underlying problems and can lead to a worsened economic situation. Another economic boom - If a collapse does not happen first, eventually the Fed's massive money printing and credit expansion could artificially boost economic indicators and GDP. Given the likelihood that this would reach all parts of the economy (i.e. rather than just housing or a given sector) the size of the unjustified over-investment could lead to a much more powerful and deep economic bust. What Can Result From an Economic Collapse? Imagine if the money you have in your savings account, checking account, or U.S. treasurys, which you thought were all safe places save your hard-earned money, lost half or even 90% of their value overnight. This is exactly what can happen in our current situation. This can have a catastrophic effect on the economy and social well-being. Further economic deterioration leads to rising unemployment. Unemployment benefits eventually run out. The government has added an extension to unemployment benefits, but hundreds of thousands of people are passing the time limit of the extension. People will have devalued dollars and in many cases no income or hope of income at all. Racial tensions because Obama ratings may drop and blame could be placed – Various races may attempt to place blame on one another. Class tension because of a large percentage of the population receiving entitlements and bailouts (handouts) while producing nothing. Entitlement and bailout outlays are increasing while ability to produce/create is decreasing. With so many possibilities of how the U.S. economic situation can play out, it is difficult to know exactly how to prepare. Below are some ideas that may be helpful as you evaluate your own personal situation. Don't play the stock market unless you are intimately familiar with the economic situation and investing. There will be continued extreme volatility in the markets and a lot of known and unknown triggers for industries to collapse, while very few winners will emerge. PE ratios are still quite high. The stock market will rise if there is inflation, but the business and currency values won't. For example, Zimbabwe had the greatest performing stock market in the world during their hyperinflation, yet their economy was in complete collapse. Diversify your investments. Precious metals such as gold and silver are strong with uncertainties in inflation, government, and currencies. Have at least a little gold and silver in your house as a safety fund. Also various other commodities do well in economic crises. Food/agriculture commodities could be a nice idea as they usually do quite well in inflationary environments, and food shortages are likely to be prevalent in the near future as recent major droughts and population growth are effecting food supply and demand. Minimize your fixed income investment exposure, such as money markets, CD's, savings accounts, or U.S. Treasurys. The amount of money you have in cash should be minimal and as liquid as possible so that you can move money to safer places in anticipation of a crisis. Note that you want to try to figure out where to put your money before the crisis happens, as once it happens, it will be too late as your money will have already lost its value. If you have significant debt, there are two sides to the payoff argument. One side says pay off debt as quickly as possible so that you don't run the risk of it becoming more expensive in a deflationary environment or with rising interest rates. The other side says don't feel the need to pay off quickly as debt becomes cheaper for you as inflation kicks in; plus the government's policy moves are likely to eventually give your debt relief anyway. Evaluate your unique personal situation and come to the best conclusion for yourself. If relevant, get pension dollars as quickly as possible, or at least a strong understanding of your pension's status and funding source. Pensions are extremely pained and may not be reliable sources of income. If relevant, accelerate receiving social security payments. Social security is extremely pained and a run can be made on it. Additionally, the government is likely to decrease payment amount and extend the point at which benefits may be claimed. Aside from the payment amount decreasing, the value of the dollar amount will decrease because of inflation. 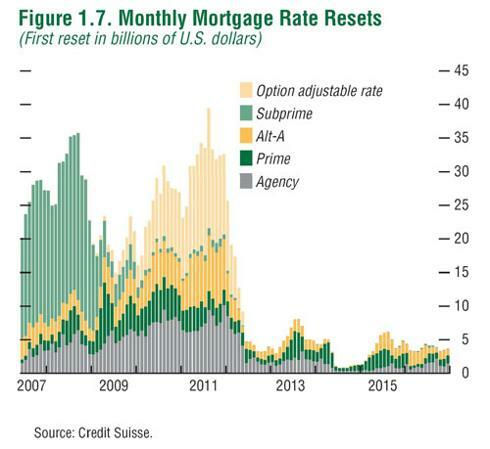 Another heavy wave of defaults is on the way from non-subprime Option ARM and Alt-A mortgages. In many cases where the Option ARM and Alt-A problems don't cause foreclosure, they will cause early sales that will add to inventory and/or push prices down further. Many are leaving major residential real-estate states such as California, Florida, Michigan, New York, etc adding to inventory and/or hurting prices in those areas. Loans are harder to get considering interest rates and bank reluctance. The government's activity is artificially propping up housing prices (even though prices are still declining). The banks will eventually have to start moving foreclosed assets off of their books at lower prices or they will face bankruptcy/nationalization. Both scenarios are not good for housing prices. This means lowered demand and excess and increasing supply. This translates to falling prices that will take a long time to bottom with a slow turnaround after the bottom. Keep in mind that after Japan's housing bubble and bust in the 80's, housing prices are still about 80% lower than they were at their peak. This does not mean there aren't still a few decent buys out there. Be sure people are moving to and not away from the area where you are buying, and viewing the purchase as a long-term living investment (as opposed to a 2 or 3 year flip) will likely be your best bet. After all, houses are real and valuable assets that act as shelter and will still be standing even if the surrounding economy takes an unprecedented dive. Evaluate your city or region and its demographics, government, and economic situation. An accessible second home or family/friend home as a retreat may be valuable depending on where you live. Additionally, it may make sense to begin evaluating your country in a similar manner. Aside from the potential future safety issues in the U.S., you may be surprised to hear that the country ranks 6th on The Heritage Foundation & Wall Street Journal's Index of Economic Freedom and 36th on the Reporters Without Borders' 2008 Press Freedom Index. Educate yourself - Understanding the situation and the potential outcomes is a major step toward proper preparation. Don't take this website's word for it. Compare mainstream and non-mainstream media and information sources and look at the facts yourself. Investigate economics, political, and financial books, blogs, and websites. A few suggestions are: Meltdown by Tom Woods, Peter Schiff books and blogs, Jim Rogers books and blogs, Ron Paul books and blogs, Mises.org, etc. Some of these measures may sound extreme. All of it may not be necessary. However, in this environment, being mentally and physically prepared for the worst case scenario is a wise strategy as anything less, but potentially still harmful, will be easier to deal with. Note: All of the graphs within this report are cited. In the interest of time, much of the other statistics are not. Arbitrary Vote is happy to provide citations and background information on any of this information at your request. The content on this site is provided without any warranty, express or implied. All opinions expressed on this site are those of the author and may contain errors or omissions. No material here constitutes investment advice nor is it a recommendation to buy or sell any financial instrument. The author may have a position in any company or security mentioned herein. Actions you undertake as a consequence of any analysis, opinion or advertisement on this site are solely your responsibility.